I Spy Animals: What Happened to The Crossbreed? 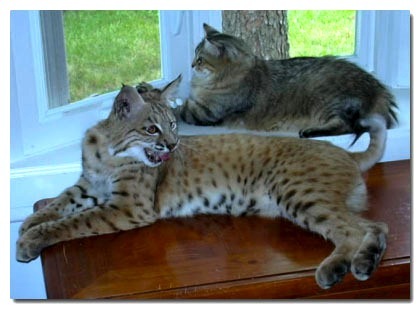 "This young adult nature novel tells the story of the life of a crossbreed cat—the offspring of a mating between a large feral female house cat and a much larger wild bobcat. The story follows the adventures of the cat from the time of his birth in southern Wisconsin, his precarious and near-fatal experience in a flash flood, a rescue by a young boy who adopts him and their accidental separation in an incident with takes the cat far away in Arkansas, where he is hunted and mistreated ... as he gradually travels overland toward home." But recently something has happened. I mean, the story is the same, but now the cover is...well, it's just plain freaky, like the publisher wanted to add a zombie flavor to attract kids reading the current vampire genre. "His mother was a housecat gone wild - a huge, tiger-striped cat who survived almost certain death at the hands of a man intent upon destroying her and her family. His father was a bobcat- a proud, cunning creature of the Wisconsin countryside, whose tumultuous courtship with her resulted ultimately in his own violent death. The Crossbreed himself was their largest offspring ... His intelligence and ability and the combination of the better attributes of both breeds enabled him to survive in a world of enemies and to undergo an incredible odyssey of over two thousand miles in four years..."
What's funny about this review is that the story of the parents of the crossbred cat takes up only a chapter or two in the whole book, whereas it's two thirds of the review. I guess hyperbole is now the way to sell a story that has stood the test of time? Anyway, even though the current cover illustration is bizarre, The Crossbreed is a great middle school/young adult story from an award-winning author, Allan Eckert. Check it out! Already read it? Tell me what you think!